Gunmen who held up a post office in Shefield and escaped on a motorbike after being hunted by the police today. They stuck at Manor Park Post Office at 5pm yesterday, with one of the robbers using a gun to threaten members of staff. The crooks escaped with 'a quantity of money' and drove off on a gold-bronze coloured motorbike. Witnesses to the raid at Manor Park Centre said that the man who brandished the gun was white and wore black clothing and a black motorcycle helmet. The other was also white and dressed in black clothing. He had his hood up and a black scarf covering his face. 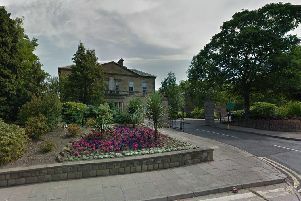 A South Yorkshire Police spokeswoman said: "Detectives in Sheffield are appealing for witnesses following a reported robbery at a Post Office in the Manor Park area yesterday. "At around 5pm, it is reported that two men with their faces covered entered the Manor Park Post Office. "One of the men, described as being white, wearing black clothing and a black motorcycle helmet, is believed to have threatened staff with what is thought to be a black handgun. "The pair left the shop with a quantity of money, fleeing the scene on a sports bike which is believed to be gold/bronze in colour. "Nobody was reportedly injured during the incident. "Enquiries are ongoing and officers are keen to hear from anyone who holds information. "Did you see anything in the area yesterday evening? Are you able to help officers with the investigation?" Call South Yorkshire Police on 101 and quote incident number 777 of November 20.